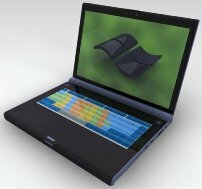 New laptop manufacturer NajmTek plans to launch a dual-screen laptop called the U-Book (“Universal Notebook”) at CES, much like Acer announced its dual-screen Acer Iconia last year at CES. Like the Acer Iconia, the U-Book replaces the traditional keyboard with a multi-touch screen. One of the benefits of a touchscreen keyboard, NajmTek suggests on its U-Book product page, is multi-language support, so you can easily display Latin, Cyrillic, or other keyboards with special characters, and also quickly switch between keyboards. Not many people need multi-language support, however. More useful for most of us may be the multi-function capabilities of the touchscreen: A number of different keyboard layouts will be available, including ones displaying special launch keys, a trackpad, calculator, and more. Even more interesting and groundbreaking: NajmTek promises users will be able to create and save their own custom keyboard layouts, changing key colors, shortkeys, button orders, and key sizes. Otherwise, the U-Book looks like a standard laptop -- probably a desktop replacement rather than a sleek ultraportable. Currently, NajmTek is showing only simple renders of the U-Book and brief details on the laptop’s specs. The U-Book will run off an Intel dual-core or quad-core processor, come with a 250GB or 500GB hard drive, and feature an Nvidia graphics card. You’ll also get the usual USB and ethernet ports, memory card reader, HD webcam, and HDMI. Expect more details on the U-Book from the CES showcase in just a little over a week.